Safe Driving With Pet Passengers | Hupy and Abraham, S.C.
For many of us, our dogs and other pets are like members of the family. It is often second nature to have them hop in the car with us, wherever our destination may be, and they are usually thrilled to come along for the ride. However, what many people fail to realize is that letting a dog freely move about the passenger areas of the vehicle causes your risks of an accident to rise significantly. You, and your pet, could be seriously injured if they are not properly secured or causing a distraction. To keep you and your pet safe, it’s strongly advised that you always restrain dogs using a harness and seat belt while driving. Check out the harnesses at your local pet store. Pet crates are also sufficient, but keep in mind that depending on its sturdiness and size, your dog could still be injured during a crash. Never let your dog ride unrestrained in the bed of a truck. There are many safety hazards associated with allowing pets to ride unrestrained in a moving vehicle. Nearly one-third (of 1,000) of dog-owning drivers admit to having been distracted by their dogs. Twenty-one percent allowed their dogs to sit in their lap, and five percent report playing with their pets as they drove. So please keep the following in mind the next time you and your canine take a ride. In the event of an accident, an unrestrained dog could become a dangerous projectile if your car stops abruptly or is hit by another car. An unrestrained dog can also interfere with the efforts of rescue workers in an emergency. In their fear, they could easily run into the road and cause another accident, or hurt rescue personnel during a critical time. 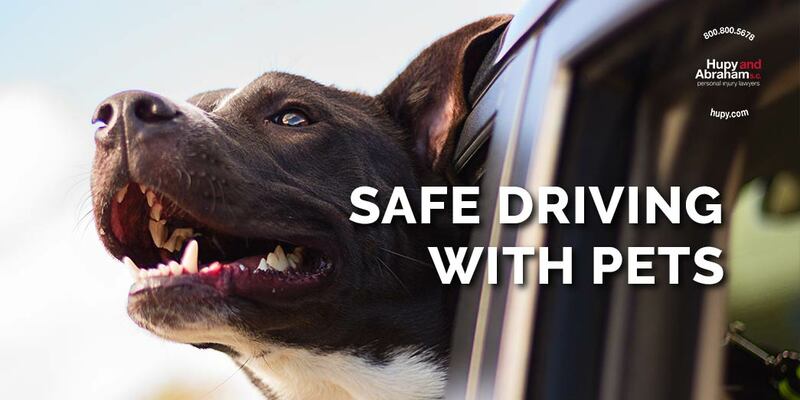 As long as your pet is safe, comfortable and secure, there is no reason they can’t join you for a ride. But if you or someone you love has been hurt due to a driver who was negligent or distracted while driving with an unsecured pet, you should contact a personal injury attorney from Hupy and Abraham right away. Call 800-800-5678 to schedule a consultation, or start a live chat with us anytime at Hupy.com.